There has been little, if any, research looking at how well practical science communicators are connected with the relevant research literature. Indeed, there is little—if anything—written about who makes up the science communication community. This chapter reports on a short survey of attendees at the British Association for the Advancement of Science’s 2007 Science Communication conference. The survey gives some indication of what science communicators have by way of training, and what they are reading that is relevant to their professional lives. It finds that the community is relatively young and predominantly female, with generally high levels of science education. Training in science communication is less prevalent, however, and over 40% of the conference delegates who responded did not read any of the relevant journals in the field. 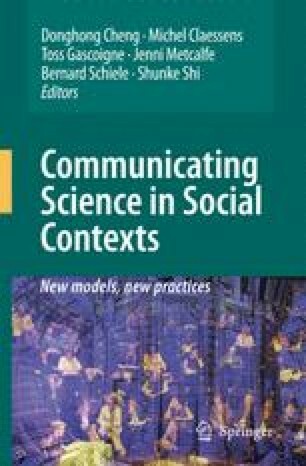 This chapter discusses whether there may be mutual misunderstanding between science communication practitioners and social scientists who carry out research in the area. It puts forward an example of the use of research on public perceptions of risk in science communication training. UK Government (2003). GM Nation? Report. Retrieved from http://www.gmnation.org.uk/docs/gmnation_finalreport.pdf.